Change your desktop picture through your menu. Is there a better alternative to Picture Switcher? Is Picture Switcher really the best app in Desktop category? Will Picture Switcher work good on macOS 10.13.4? Picture Switcher is an application that will place a menu on the right side of your menu bar to switch desktop pictures. It gives you additional options beyond the built in system that greatly enhance your desktop experience. Core Image - Core Image is used to create stunning effects on your pictures, as well as adding several new options when transitioning from one picture to another. 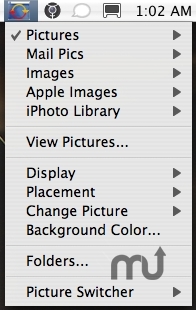 New placement - A new placement type has been added with Picture Switcher: 'Scale to Fill Screen'. This will scale your picture proportionally to fit the screen. Picture Switcher needs a rating. Be the first to rate this app and get the discussion started! Settable Keyboard Shortcuts - Picture Switcher now allows you to set keyboard shortcuts for many of its options, including its new option that will immediately change the picture. Applescript - Applescript support has been added, with full access to changing the picture and its options.